Shtokavian, Stokavian or Štokavian (/ʃtɒˈkɑːviən, -ˈkæv-/; Serbo-Croatian: štokavski / штокавски, pronounced [ʃtǒːkaʋskiː]) is the prestige dialect of the pluricentric Serbo-Croatian language and the basis of its Serbian, Croatian, Bosnian and Montenegrin standards. It is a part of the South Slavic dialect continuum. Its name comes from the form for the interrogatory pronoun for "what" in Western Shtokavian, što (it is šta in Eastern Shtokavian). This is in contrast to Kajkavian and Chakavian (kaj and ča also meaning "what"). Shtokavian is spoken in Serbia, Montenegro, Bosnia and Herzegovina, much of Croatia, as well as the southern part of Austria’s Burgenland. The primary subdivisions of Shtokavian are based on two principles: one is whether the subdialect is Old-Shtokavian or Neo-Shtokavian, and different accents according to the way the old Slavic phoneme jat has changed. 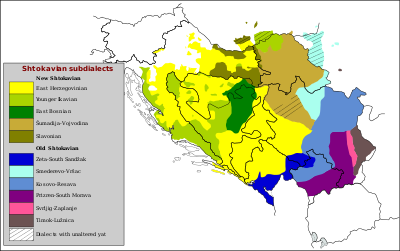 Modern dialectology generally recognises seven Shtokavian subdialects. The Proto-Shtokavian idiom appeared in the 12th century. In the following century or two, Shtokavian was divided into two zones: western, which covered the major part of Bosnia and Herzegovina and Slavonia in Croatia, and eastern, dominant in Serbia, easternmost Bosnia and Herzegovina and greater parts of Montenegro. Western Shtokavian was principally characterized by a three-accent system, whereas eastern Shtokavian was marked by a two-accent system. According to research of historical linguistics, Old-Shtokavian was well established by the mid-15th century. In this period it was still mixed with Church Slavonic to varying degrees. As can be seen from the image on the right, originally the Shtokavian dialect covered a significantly smaller area than it covers today, meaning that the Shtokavian speech has spread for the last five centuries, overwhelmingly at the expense of Chakavian and Kajkavian idioms. Modern areal distribution of these three dialects as well as their internal stratification (Shtokavian and Chakavian in particular) is primarily a result of the migrations resulting from the spread of Ottoman Empire in the Balkans. Migratory waves were particularly strong in the 16th–18th century, bringing about large-scale linguistic and ethnic changes on the Central South Slavic area. (See: Great Serb Migrations). By far the most numerous, mobile and expansionist migrations were those of Ijekavian-Shtokavian speakers of eastern Herzegovina, who have spread into most of Western Serbia, many areas of eastern and western Bosnia, large swathes of Croatia (Banovina, Kordun, Lika, parts of Gorski kotar, continental parts of northern Dalmatia, some places north of Kupa, parts of Slavonia, southeastern Baranya etc.). This is the reason Eastern Herzegovinian is the most spoken Serbo-Croatian dialect today, and why it bears the name that is only descriptive of its area of origin. These migrations also played the pivotal role in the spread of Neo-Shtokavian innovations. Shtokavian is characterized by a number of characteristic historical sound changes, accentual changes, changes in inflection, morphology and syntax. Some of these isoglosses are not exclusive and have also been shared by neighboring dialects, and some of them have mostly but not completely spread over the whole Shtokavian area. The differences between Shtokavian and the unrelated, neighboring Bulgarian–Macedonian dialects are clear-cut, whereas the differences with the related Serbo-Croatian dialects of Chakavian and Kajkavian are much more fluid, and the mutual influence of various subdialects plays a more prominent role. As can be seen from the list, many of this isoglosses are missing from particular Shtokavian idioms, just as many of them are shared with neighboring non-Shtokavian dialects. The Shtokavian dialect is divided into Old-Shtokavian and Neo-Shtokavian subdialects. The primary distinction is the accentuation system: although there are variations, "old" dialects preserve the older accent system, which consists of two types of falling (dynamic) accents, one long and one short, and unstressed syllables, which can be long and short. Both long and short unstressed syllables could precede the stressed syllables. Stress placement is free and mobile in paradigms. In the process known as "Neo-Shtokavian metatony" or "retraction", length of the old syllables was preserved, but their quality changed. Stress (intensity) on the inner syllables moved to the preceding syllable, but they kept the high pitch. That process produced the "rising" accents characteristic for Neo-Shtokavian, and yielded the modern four-tone system. Stress on the initial syllables remained the same in quality and pitch. Most speakers of Shtokavian, native or taught, from Serbia and Croatia do not distinguish between short rising and short falling tones. They also pronounce most unstressed long vowels as short, with some exceptions, such as genitive plural endings. Falling accents may only occur word-initially (otherwise it would have been retracted). Rising accents may occur anywhere except word-finally. thus, monosyllabic words may only have falling accent. Unstressed length may only appear after a stressed syllable. In practice, influx of foreign words and formation of compound words have loosened these rules, especially in spoken idioms (e.g. paradȁjz, asistȅnt, poljoprȉvreda), but they are maintained in standard language and dictionaries. The most conservative dialects[how?] stretch southeast from Timok near the Bulgarian border to Prizren. There is disagreement among linguists whether these dialects belong to the Shtokavian area, because there are many other morphological characteristics apart from rendering of što (also, some dialects use kakvo or kvo, typical for Bulgarian), which would place them into a "transitional" group between Shtokavian and Eastern South Slavic languages (Bulgarian and Macedonian). The Timok-Prizren group falls to the Balkan language area: declension has all but disappeared, the infinitive has yielded to subjunctives da-constructions, and adjectives are compared exclusively with suffixes. The accent in the dialect group is a stress accent, and it falls on any syllable in the word. The old semi-vowel[clarification needed] has been retained throughout. The vocalic l has been retained (vlk = vuk), and some dialects don't distinguish ć/č and đ/dž by preferring the latter, postalveolar variants. Some subdialects preserve l at the end of words (where otherwise it has developed into a short o) – došl, znal, etc. (cf. Kajkavian and Bulgarian); in others, this l has become the syllable ja. Torlakian is spoken in Metohija, around Prizren, Gnjilane and Štrpce especially, in Southern Serbia around Bujanovac, Vranje, Leskovac, Niš, Aleksinac, in the part of Toplica Valley around Prokuplje, in Eastern Serbia around Pirot, Svrljig, Soko Banja, Boljevac, Knjaževac ending up with the area around Zaječar, where the Kosovo-Resava dialect becomes more dominant. It has been recorded several exclaves with Torlakian speeches inside Kosovo-Resava dialect area. One is the most prominent and preserved, like village Dublje near Svilajnac, where the majority of settlers came from Torlakian speaking village Veliki Izvor near Zajecar. Few centuries ago, before settlers from Kosovo and Metohija brought Kosovo-Resava speeches to Eastern Serbia (to Bor and Negotin area), Torlakian speech had been overwhelmingly represented in this region. Also called the Archaic Šćakavian dialect, it is spoken by Croats who live in some parts of Slavonia, Bačka, Baranja, Syrmia, in Croatia and Vojvodina, as well as in northern Bosnia. The Slavonian dialect has mixed Ikavian and Ekavian pronunciations. Ikavian accent is predominant in the Posavina, Baranja, Bačka, and in the Slavonian subdialect enclave of Derventa, whereas Ekavian accent is predominant in Podravina. There are enclaves of one accent in the territory of the other, as well as mixed Ekavian–Ikavian and Jekavian–Ikavian areas. In some villages in Hungary, the original yat is preserved. Local variants can widely differ in the degree of Neo-Shtokavian influences. In two villages in Posavina, Siče and Magića Male, the l, as in the verb nosil, has been retained in place of the modern nosio. In some villages in the Podravina, čr is preserved instead of the usual cr, for example in črn instead of crn. Both forms are usual in Kajkavian but very rare in Shtokavian. Also called Jekavian-šćakavian, it is a base for the Bosnian language. It has Jekavian pronunciations in the vast majority of local forms and it is spoken by the majority of Bosniaks living in that area, which includes the bigger Bosnian cities Sarajevo, Tuzla, and Zenica, and by most of Croats and Serbs that live in that area (Vareš, Usora, etc.). Together with basic Jekavian pronunciation, mixed pronunciations exist in Tešanj and Maglaj dete–djeteta (Ekavian–Jekavian) and around Žepče and Jablanica djete–diteta (Jekavian–ikavian). In the central area of the subdialect, the diphthong uo exists in some words instead of the archaic l and more common u like vuok or stuop, instead of the standard modern vuk and stup. Also known as Đekavian-Ijekavian, it is spoken in eastern Montenegro, in Podgorica and Cetinje, around the city of Novi Pazar in eastern Raška in Serbia, and by descendents of Montenegrin settlers in the single village of Peroj in Istria. The majority of its speakers are Serbs and Montenegrins and Muslims from Serbia and Montenegro. Together with the dominant Jekavian pronunciation, mixed pronunciations like djete–deteta (Jekavian–Ekavian) around Novi Pazar and Bijelo Polje, dite–đeteta (Ikavian–Jekavian) around Podgorica and dete–đeteta (Ekavian–Jekavian) in the village of Mrkojevići in southern Montenegro. Mrkojevići are also characterised by retention of čr instead of cr as in the previously mentioned villages in Podravina. Some vernaculars have a very open /ɛ/ or /æ/ as their reflex of ь/ъ, very rare in other Shtokavian vernaculars (sæn and dæn instead of san and dan). Other phonetic features include sounds like ʑ in iʑesti instead of izjesti, ɕ as in ɕekira instead of sjekira. However these sounds are known also to many in East Herzegovina like those in Konavle, and are not Zeta–Raška specific . There is a loss of the /v/ sound apparent, seen in čo'ek or đa'ola. The loss of distinction between /ʎ/ and /l/ in some vernaculars is based on a substratum. Word pljesma is a hypercorrection (instead of pjesma) because many vernaculars have changed lj to j. All verbs in infinitive finish with "t" (example: pjevat 'sing'). This feature is also present in most vernaculars of East Herzegovinian, and actually almost all Serbian and Croatian vernaculars. The group a + o gave ā /aː/ (kā instead of kao, rekā for rekao), like in other seaside vernaculars. Elsewhere, more common is ao > ō. Also called Older Ekavian, is spoken by Serbs, mostly in western and northeastern Kosovo (Kosovo Valley with Kosovska Mitrovica and also around Peć), in Ibar Valley with Kraljevo, around Kruševac, Trstenik and in Župa, in the part of Toplica Valley (Kuršumlija) in the Morava Valley (Jagodina, Ćuprija, Paraćin, Lapovo), in Resava Valley (Svilajnac, Despotovac) and northeastern Serbia (Smederevo, Požarevac, Bor, Majdanpek, Negotin, Velika Plana) with one part of Banat (around Kovin, Bela Crkva and Vršac). This dialect can be also found in parts of Banatska Klisura (Clisura Dunării) in Romania, in places where Romanian Serbs live (left bank of the Danube). Substitution of jat is predominantly Ekavian accent even on the end of datives (žene instead of ženi), in pronouns (teh instead of tih), in comparatives (dobrej instead of dobriji) in the negative of biti (nesam instead of nisam); in Smederevo–Vršac dialects, Ikavian forms can be found (di si instead of gde si?). Smederevo-Vršac dialect (spoken in northeastern Šumadija, Lower Great Morava Valley and Banat) is sometimes classified as a subdialect of the Kosovo-Resava dialect but is also considered to be a separate dialect as it the represents mixed speech of Šumadija-Vojvodina and Kosovo-Resava dialects. Also called Western Ikavian or Younger Ikavian. The majority of its speakers are Croats who live in Lika, Kvarner, Dalmatia, Herzegovina and Bunjevci and Croats of north Bačka around Subotica. The minority speakers of it include Bosniaks in western Bosnia, mostly around the city of Bihać, and also in central Bosnia where Croats and Bosniaks (Travnik, Jajce, Bugojno, Vitez, ..) used to speak this dialect. Exclusively Ikavian accent, Bosnian and Herzegovinian forms use o in verb participle, whereas those in Dalmatia and Lika use -ija or ia like in vidija/vidia. Local form of Bačka was proposed as the base for the Bunjevac dialect of Bunjevci in Vojvodina. Also known as Western (I)jekavian, in earlier centuries, this subdialect was the independent subdialect of Western Shtokavian dialect. It is spoken by Croats who live in some parts of Dubrovnik area. The Dubrovnik dialect has mixed Jekavian and Ikavian pronunciations or mixed Shtokavian and Chakavian vocabulary. Some vocabulary from Dalmatian, older Venetian and modern Italian are also present. It is a base for the Croatian language. The dialect today is considered to be a part of East Herzegovina subdialect because it is similar to it. It retained certain unique features that distinguish it from the original East Herzegovina subdialect. Also known as Younger Ekavian, is one of the bases for the standard Serbian language. It is spoken by Serbs across most of Vojvodina (excluding easternmost parts around Vršac), northern part of western Serbia, around Kragujevac and Valjevo in Šumadija, in Mačva around Šabac and Bogatić, in Belgrade and in Serb villages in eastern Croatia around the town of Vukovar. In some extent, among Croats in Ilok and partly in Vukovar this dialect can be also found today. It is predominately Ekavian (Ikavian forms are of morphophonological origin). In some parts of Vojvodina the old declension is preserved. Most Vojvodina dialects and some dialects in Šumadija have an open e and o[clarification needed]. However the vernaculars of western Serbia, and in past to them connected vernaculars of (old) Belgrade and southwestern Banat (Borča, Pančevo, Bavanište) are as close to the standard as a vernacular can be. The dialect presents a base for the Ekavian variant of the Serbian standard language. Also called Eastern Herzegovininan or Neo-Ijekavian. It encompasses by far the largest area and the number of speakers of all Shtokavian dialects. It is the dialectal basis of the standard literary Croatian, Bosnian, Serbian, and Montenegrin languages. western Montenegro – spoken south Ijekavian variant. 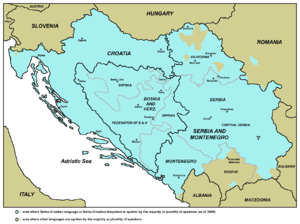 Croats western Ijekavian variant micro groups in region Slavonia, Banovina, Kordun, Žumberak, Neretva, East Herzegovina (Ravno, Stolac, Buna, Neum), around of region Dubrovnik, and is the basis of the Croatian standard. City: (Osijek, Bjelovar, Daruvar, Sisak, Pakrac, Petrinja Dubrovnik, Metković). Serbs east Ijekavian variant groups; East Bosnia, East Herzegovina (Trebinje, Nevesinje, Bileća), Bosnian Krajina, western Serbia and Podrinje (Užice, Čačak, Ivanjica, Loznica, Priboj, Prijepolje ) and minority Croatian Serbs. City: Trebinje, Bijeljina, Banja Luka, Nevesinje, Pale. Its south-eastern form is characterised by the total lack of /x/ sound that is sometimes not only left out or replaced by more common /j/ or /v/ but is replaced as well by less common /k/ and /ɡ/ (bijak, bijaku imperfect of verb biti). Local forms in the Žumberak enclave and around Dubrovnik or Slunj have some special Croatian features, influenced from Chakavian and the western subdialect, whereas forms in Bjelovar or Pakrac are influenced from Kajkavian. in Ijekavian or Jekavian pronunciation (ijekavski [ijěːkaʋskiː] or jekavski [jěːkaʋskiː]), it has come to be pronounced ije or je, depending on whether the vowel was long or short. In standard Croatian, pronunciation is always jekavian je, although when yat is short then is je (written as je), and when yat is long then is je: - e is long (written as ije). Historically, the yat reflexes had been inscribed in Church Slavic texts before the significant development of Shtokavian dialect, reflecting the beginnings of the formative period of the vernacular. In early documents it is predominantly Church Slavic of the Serbian or Croatian recension (variant). The first undoubted Ekavian reflex (beše 'it was') is found in a document from Serbia dated 1289; the first Ikavian reflex (svidoci 'witnesses') in Bosnia in 1331; and first (I)jekavian reflex (želijemo 'we wish', a "hyper-Ijekavism") in Croatia in 1399. Partial attestation can be found in earlier texts (for instance, Ikavian pronunciation is found in a few Bosnian documents from the latter half of the 13th century), but philologists generally accept the aforementioned dates. In the second half of the 20th century, many vernaculars with unsubstituted yat[clarification needed] are found. The intrusion of the vernacular into Church Slavic grew in time, to be finally replaced by the vernacular idiom. This process took place for Croats, Serbs and Bosniaks independently and without mutual interference until the mid-19th century. Historical linguistics, textual analysis and dialectology have dispelled myths about allegedly "unspoilt" vernacular speech of rural areas: for instance, it is established that Bosniaks have retained phoneme "h" in numerous words (unlike Serbs and Croats), due to elementary religious education based on the Quran, where this phoneme is the carrier of specific semantic value. Long ije is pronounced as a single syllable, [jeː], by many Ijekavian speakers. In Zeta dialect and most of East Herzegovina dialect, however, it is pronounced as two syllables, [ije]. The distinction can be clearly heard in first verses of national anthems of Croatia and Montenegro—they're sung as "Lje-pa na-ša do-mo-vi-no" and "Oj svi-je-tla maj-ska zo-ro" respectively. The Ikavian pronunciation is the only one that is not part of any standard variety of Serbo-Croatian. This has led to a reduction in its use and an increase in the use of Ijekavian in traditionally Ikavian areas since the standardization. For example, most people in Split, Croatia today use both Ikavian and Ijekavian words in everyday speech without a predictable pattern. During the first half of the 19th century, protagonists of nascent Slavic philology were, as far as South Slavic dialects were concerned, embroiled in frequently bitter polemic about "ethnic affiliation" of native speakers of various dialects. This, from contemporary point of view, rather bizarre obsession was motivated primarily by political and national interests that prompted philologists-turned-ideologues to express their views on the subject. The most prominent contenders in the squabble, with conflicting agenda, were the Czech philologist Josef Dobrovský, the Slovak Pavel Šafárik, the Slovenes Jernej Kopitar and Franz Miklosich, the Serb Vuk Karadžić, the Croat of Slovak origin Bogoslav Šulek, and the Croatians Vatroslav Jagić and Ante Starčević. The dispute was primarily concerned with who can, philologically, be labelled as "Slovene", "Croat" and "Serb" with the aim of expanding one's national territory and influence. Born in the climate of romanticism and national awakening, these polemical "battles" led to increased tensions between the aforementioned nations, especially because the Shtokavian dialect cannot be split along ethnic lines in an unequivocal manner. However, contemporary native speakers, after process of national crystallization and identification had been completed, can be roughly identified as predominant speakers of various Shtokavian subdialects. Because standard languages propagated through media have strongly influenced and altered the situation in the 19th century, the following attribution must be treated with necessary caution. Zeta-South Sanjak dialect (Ijekavian accent): Montenegrin, Bosniak and Serbian. Proto-Shtokavian, or Church Slavic with ingredients of nascent Shtokavian, were recorded in legal documents like the charter of Ban Kulin, regulating the commerce between Bosnia and Dubrovnik in Croatia, dated 1189, and in liturgical texts like Gršković’s and Mihanović’s fragments, ca. 1150, in southern Bosnia or Herzegovina. Experts' opinions are divided with regard to the extent these texts, especially the Kulin ban parchment, contain contemporary Shtokavian vernacular. Mainly Shtokavian, with ingredients of Church Slavic, are numerous legal and commercial documents from pre-Ottoman Bosnia, Hum, Serbia, Zeta, and southern Dalmatia, especially Dubrovnik. The first comprehensive vernacular Shtokavian text is the Vatican Croatian Prayer Book, written in Dubrovnik a decade or two before 1400. In the next two centuries Shtokavian vernacular texts had been written mainly in Dubrovnik, other Adriatic cities and islands influenced by Dubrovnik, as well as in Bosnia, by Bosnian Franciscans and Bosniak Muslim vernacular alhamiado literature – the first example being "Chirwat turkisi" or "Croatian song", dated 1589. The standard Bosnian, Croatian, Montenegrin, and Serbian variants of the pluricentric Serbo-Croatian standard language are all based on the Neo-Shtokavian dialect. However, it must be stressed that standard variants, irrespectively of their mutual differences, have been stylised in such manners that parts of the Neo-Shtokavian dialect have been retained—for instance, declension—but other features were purposely omitted or altered—for instance, the phoneme "h" was reinstated in the standard language. Croatian has had a long tradition of Shtokavian vernacular literacy and literature. It took almost four and half centuries for Shtokavian to prevail as the dialectal basis for the Croatian standard. 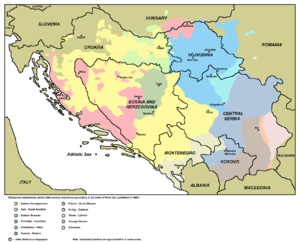 In other periods, Chakavian and Kajkavian dialects, as well as hybrid Chakavian–Kajkavian–Shtokavian interdialects "contended" for the Croatian national koine – but eventually lost, mainly due to historical and political reasons. By the 1650s it was fairly obvious that Shtokavian would become the dialectal basis for the Croatian standard, but this process was finally completed in the 1850s, when Neo-Shtokavian Ijekavian, based mainly on Ragusan (Dubrovnik), Dalmatian, Bosnian, and Slavonian literary heritage became the national standard language. Serbian was much faster in standardisation. Although vernacular literature was present in the 18th century, it was Vuk Karadžić who, between 1818 and 1851, made a radical break with the past and established Serbian Neo-Shtokavian folklore idiom as the basis of standard Serbian (until then, educated Serbs had been using Serbian Slavic, Russian Slavic and hybrid Russian–Serbian language). Although he wrote in Serbian Ijekavian accent, the majority of Serbs have adopted Ekavian accent, which is dominant in Serbia. Serbs in Croatia and Bosnia, as well as Montenegrins, use the Ijekavian accent. Bosnian is only currently beginning to take shape. The Bosniak idiom can be seen as a transition between Serbian Ijekavian and Croatian varieties, with some specific traits. After the collapse of Yugoslavia, Bosniaks affirmed their wish to stylize their own standard language, based on the Neo-Shtokavian dialect, but reflecting their characteristics—from phonetics to semantics. Also, the contemporary situation is unstable with regard to the accentuation, because phoneticians have observed that the 4-accents speech has, in all likelihood, shown to be increasingly unstable, which resulted in proposals that a 3-accents norm be prescribed. This is particularly true for Croatian, where, contrary to all expectations, the influence of Chakavian and Kajkavian dialects on the standard language has been waxing, not waning, in the past 50–70 years. The Croatian, Serbian, and Bosnian standard variants, although all based on the East Herzegovinian subdialect of Neo-Shtokavian and mutually intelligible, do differ slightly, as is the case with other pluricentric languages (English, Spanish, German and Portuguese, among others), but not to a degree which would justify considering them as different languages. Their structures are grammatically and phonologically almost identical, but have differences in vocabulary and semantics. See Differences between standard Bosnian, Croatian and Serbian. Example: Što jest, jest; tako je uv(ij)ek bilo, što će biti, (biće / bit će), a nekako će već biti! English: Cooking salt is a compound of sodium and chlorine. Croatian: Kuhinjska sol je spoj natrija i klora. Serbian Latin: Kuhinjska so je jedinjenje natrijuma i hlora. Bosnian: Kuhinjska so je spoj natrija i hlora. ^ Hammarström, Harald; Forkel, Robert; Haspelmath, Martin, eds. (2017). "Shtokavski". Glottolog 3.0. Jena, Germany: Max Planck Institute for the Science of Human History. ^ Sussex & Cubberly (2006:506) "The core of the modern literary languages and the major dialect area, is Shtokavian (što ‘what’), which covers the rest of the area where Serbo-Croatian is spoken." ^ Kašić, Zorka (1995). "Govor Konavala". Srpski dijalektološki zbornik. XLI: 241–395. ^ "Hrvatski jezični portal (3)". Retrieved 21 March 2015. ^ a b "Hrvatski jezični portal (4)". Retrieved 21 March 2015. Alexander, Ronelle (2000). In honor of diversity: the linguistic resources of the Balkans. Kenneth E. Naylor memorial lecture series in South Slavic linguistics ; vol. 2. Columbus, Ohio: Ohio State University, Dept. of Slavic and East European Languages and Literatures. OCLC 47186443. —— (2006). Bosnian/Croatian/Serbian - A Grammar with Sociolinguistic Commentary. The University of Wisconsin Press. ISBN 978-0-299-21194-3. Blum, Daniel (2002). Sprache und Politik : Sprachpolitik und Sprachnationalismus in der Republik Indien und dem sozialistischen Jugoslawien (1945–1991) [Language and Policy: Language Policy and Linguistic Nationalism in the Republic of India and the Socialist Yugoslavia (1945–1991)]. Beiträge zur Südasienforschung ; vol. 192 (in German). Würzburg: Ergon. p. 200. ISBN 3-89913-253-X. OCLC 51961066. Friedman, Victor (1999). Linguistic emblems and emblematic languages: on language as flag in the Balkans. Kenneth E. Naylor memorial lecture series in South Slavic linguistics ; vol. 1. Columbus, Ohio: Ohio State University, Dept. of Slavic and East European Languages and Literatures. OCLC 46734277. Gröschel, Bernhard (2003). "Postjugoslavische Amtssprachenregelungen - Soziolinguistische Argumente gegen die Einheitlichkeit des Serbokroatischen?" [Post-Yugoslav Official Languages Regulations – Sociolinguistic Arguments Against Consistency of Serbo-Croatian?]. Srpski jezik (in German). 8 (1–2): 135–196. ISSN 0354-9259. Retrieved 14 April 2015. (COBISS-Sr). Kordić, Snježana (2004). "Pro und kontra: "Serbokroatisch" heute" [Pro and con: "Serbo-Croatian" nowadays] (PDF). In Krause, Marion; Sappok, Christian. Slavistische Linguistik 2002: Referate des XXVIII. Konstanzer Slavistischen Arbeitstreffens, Bochum 10.-12. September 2002. Slavistishe Beiträge ; vol. 434 (in German). Munich: Otto Sagner. pp. 97–148. ISBN 3-87690-885-X. OCLC 56198470. Archived (PDF) from the original on 4 August 2012. Retrieved 2 October 2013. (ÖNB). —— (2009). "Policentrični standardni jezik" [Polycentric Standard Language] (PDF). In Badurina, Lada; Pranjković, Ivo; Silić, Josip. Jezični varijeteti i nacionalni identiteti (in Serbo-Croatian). Zagreb: Disput. pp. 83–108. ISBN 978-953-260-054-4. OCLC 437306433. Archived (PDF) from the original on 4 August 2012. Retrieved 31 January 2015. (ÖNB). —— (2009). "Plurizentrische Sprachen, Ausbausprachen, Abstandsprachen und die Serbokroatistik" [Pluricentric languages, Ausbau languages, Abstand languages and the Serbo-Croatians] (PDF). Zeitschrift für Balkanologie (in German). 45 (2): 210–215. ISSN 0044-2356. OCLC 680567046. ZDB-ID 201058-6. Archived from the original on 4 August 2012. Retrieved 6 May 2014. Kristophson, Jürgen (2000). "Vom Widersinn der Dialektologie: Gedanken zum Štokavischen" [Dialectological Nonsense: Thoughts on Shtokavian]. Zeitschrift für Balkanologie (in German). 36 (2): 178–186. ISSN 0044-2356. Škiljan, Dubravko (2002). Govor nacije: jezik, nacija, Hrvati [Voice of the Nation: Language, Nation, Croats]. Biblioteka Obrisi moderne (in Serbo-Croatian). Zagreb: Golden marketing. OCLC 55754615. Thomas, Paul-Louis (2003). "Le serbo-croate (bosniaque, croate, monténégrin, serbe): de l'étude d'une langue à l'identité des langues" [Serbo-Croatian (Bosnian, Croatian, Montenegrin, Serbian): from the study of a language to the identity of languages]. Revue des études slaves (in French). 74 (2–3): 311–325. ISSN 0080-2557. OCLC 754204160. ZDB-ID 208723-6. Retrieved 23 September 2015.